REDONDO BEACH, Calif. - Millions of anchovies and sardines have washed up dead in a Southern California marina and a spokeswoman says they apparently suffocated. 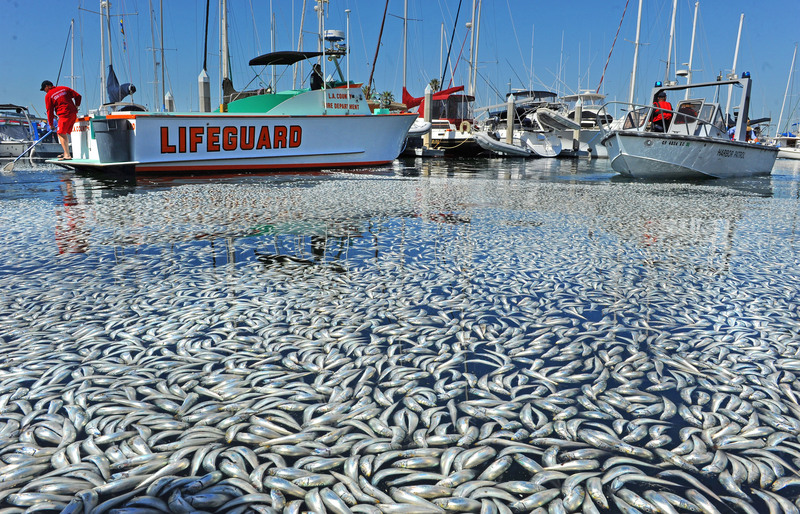 Staci Gabrielli, marine coordinator for King Harbor Marina in Redondo Beach, says boaters awakened Tuesday to find the silvery fish surrounding their vessels. Gabrielli says it's believed the fish moved into the harbor late Monday or early Tuesday to escape a red tide, a naturally occurring bloom of toxic algae that can poison fish or starve them of oxygen. Gabrielli says high winds apparently kept the fish from leaving the harbor and they all crushed up against the harbor wall, where they used up the oxygen and suffocated. Another possible explanation is that the anchovies are prey for bigger fish and marine mammals, so large numbers may have swarmed into the harbor from deeper waters seeking shelter, reports Reuters. Gabrielli says there are millions of fish and they're so thick in some places that boats can't get out of the harbor. Trudy Padilla, the marina's tenant services coordinator, told Reuters that the dead fish suddenly began showing up overnight, and that one end of the marina has been blocked off as cleanup operations get organized. She said the smell of decay has not become so strong yet, "but it's going to if they don't clean up the fish." King Harbor Marina is on the Santa Monica Bay coast, about 22 miles southeast of downtown Los Angeles, and provides 850 boat slips to private vessels.